On the frozen planet of Thuvhe, both native Thuvhesits and their conquerors, the Shotet, worship the universal current that blesses them with current-gifts. Shotet warrior-princess Cyra Noavek’s deadly talent is used by her ruthless brother, Ryzek, to torture his enemies—a gift that also leaves her in constant, excruciating agony. When Ryzek hears that Akos, a Thuvhesit farm-boy, can neutralize the current-gift of others, he removes him from his family and brings him to the palace to act as companion and cure-all for Cyra. As the two grow from reluctant acquaintances to fast friends, a flurry of activity from the surrounding cast of characters slowly drives the plot forward, culminating in a revolt against Ryzek’s power. Veronica Roth’s latest is a lot to take in, and is as different from her bestselling debut, Divergent, as day is from night. 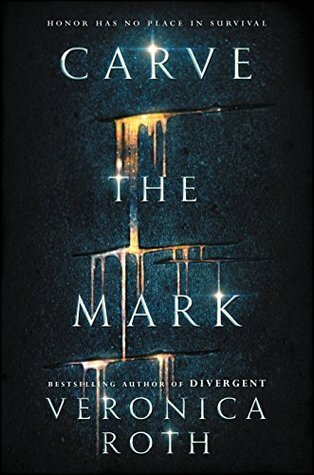 While Divergent is a flawed dystopian tale, an obvious first novel told by a talented yet inexperienced novice, Carve the Mark is something else entirely. It’s a soaring space opera peopled by complex characters, with a believable story-universe made all the more real by intricate world-building details. The action is a bit slow to build, but since the author takes pains to establish necessary backstory before moving on to the real meat of the narrative, this is a forgivable flaw. The verdict: while Divergent fans may not find this latest work to their liking, fans of space operas will definitely love it. Recommended for Gr 9 Up for violence and language.